Concrete Batching plants are designed and engineered for mixing various mortars. It has a wide range of applications specially used in construction of canals, bridges, highways, dams, multi storied & industrial buildings, factories and for ready mixed concrete works. 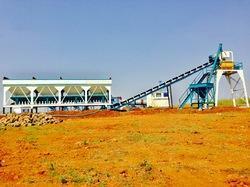 We offer stationary and mobile concrete batching plants with reversible drum / planetary mixer unit. Our range of products include : concrete batching plant, stationary concrete batching plant, concrete batching plant supplier, concrete batching plant manufacturers etc. 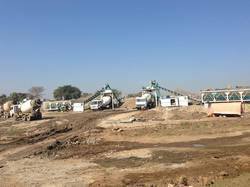 Nilkanth Engineering Works offering Pan type Mobile Concrete Batching Plant, the plant comprises of adequate capacity gravel & sand hoppers, weighing conveyor suspended on electronic load cells, Pan type mixer unit, additive tank. cement silo with screw conveyor, Rubber belt type charging conveyor, PLC based control panel. Fully automatic plant with mix material output capacity of 30 m3/hr. Easy mobility (Two Chassis); can be towed by tractor or similar power. Easy to erect since no foundation / civil work. Short cycle time and high uniform concrete quality. Two nos. twin hoppers i.e. total 4 nos. hoppers (2 x 2) for storage of gravels & sand. Each hopper storage capacity is 2.5 m3 and is fitted with pneumatically operated gates. Integral weighing conveyor is suspended on 4 nos. electronic load cells for weighing of gravel & sand. Vibratory motor is fitted on one hopper meant for sand. Rubber belt type charging conveyor transfers the weighed gravels (aggregates) and sand from the weighing conveyor beneath the hoppers to the Pan Mixer unit. Pan type Mixer unit of 0.75 m3 capacity fabricated from heavy duty steel is having 10 mm thick wear resistant replaceable liner plate. Spring loaded paddle mixer arms with replaceable blades. The mixing arms driven by Imported Planetary Gear Box coupled with 30 HP motor. Inbuilt Additive tank with self priming pump. Cement Silo of 1.5 tons storage capacity with screw conveyor for transferring the cement to Pan Mixer unit. Separate weighing arrangement with electronic load cells for cement parallel to gravel & sand weighing reduces the cycle time; thus increasing the concrete mix output. Control Cabin with PLC based control panel capable of storing 50 different recipes. Total connected Electric load 64.0 H.P. Nilkanth Engineering Works occupies the leading position in the field of manufacturing and exporting Twin Shaft Batching Plant. We manufacture these plants with dedicated care of our skilled professional, to meet the international standards. It is well-known due to its durability and it requires reduced maintenance. They are provided with twin shafts which enhances the speed and efficiency of the process cost-effective. 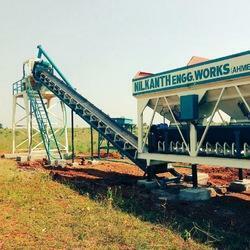 Nilanth 30 Cu Concrete Batching Plant are designed and engineered for mixing various mortars. It has a wide range of applications specially used in construction of canals, bridges, highways, dams, multi storied & industrial buildings, factories and for ready mixed concrete works. Our Concrete Batch Mix Plant are designed and engineered for mixing various mortars. It has a wide range of applications specially used in construction of canals, bridges, highways, dams, multi storied & industrial buildings, factories and for ready mixed concrete works. 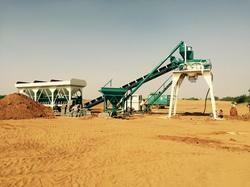 Our quality stationary and mobile concrete batching plants with reversible drum / planetary and Twin Shaft mixerunit. Our range of products include : concrete batching plant, stationary concrete batching plant, concrete batching plant supplier, concrete batching plant manufacturers etc. 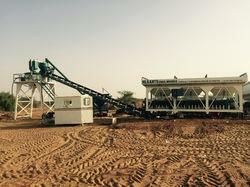 Manufacturer & Exporter of Mobile Concrete Batching Plant 18 Cu M per Hrs. Our product range also comprises of Reversible Concrete Mixer Machine and Mobile Concrete Batching Plant 30 Cu M per Hrs. Mobile Concrete Batching Plant, The plant comprises of adequate capacity gravel & sand hoppers, weighing conveyor suspended on electronic load cells, Pan type mixer unit, additive tank. cement silo with screw conveyor, Rubber belt type charging conveyor, PLC based control panel. Salient Features:Fully automatic plant with mix material output capacity of 30 m3/hr.Easy mobility (Two Chassis); can be towed by tractor or similar power.Easy to erect since no foundation / civil work.Short cycle time and high uniform concrete quality.Two nos. twin hoppers i.e. total 4 nos. hoppers (2 x 2) for storage of gravels & sand.Each hopper storage capacity is 2.5 m3 and is fitted with pneumatically operated gates.Integral weighing conveyor is suspended on 4 nos. electronic load cells for weighing of gravel & sand. Vibratory motor is fitted on one hopper meant for sand.Rubber belt type charging conveyor transfers the weighed gravels (aggregates) and sand from the weighing conveyor beneath the hoppers to the Pan Mixer unit.Pan type Mixer unit of 0.75 m3 capacity fabricated from heavy duty steel is having 10 mm thick wear resistant replaceable liner plate.Spring loaded paddle mixer arms with replaceable blades.The mixing arms driven by Imported Planetary Gear Box coupled with 30 HP motor.Inbuilt Additive tank with self priming pump.Cement Silo of 1.5 tons storage capacity with screw conveyor for transferring the cement to Pan Mixer unit.Separate weighing arrangement with electronic load cells for cement parallel to gravel & sand weighing reduces the cycle time; thus increasing the concrete mix output.Control Cabin with PLC based control panel capable of storing 50 different recipes.Total connected Electric load 64.0 H.P. 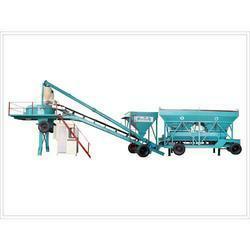 We are offering Concrete Batching Plant to our client and our product is made of good quality. Model NE-25 is a fully automatic, compact Mobile Concrete Batching Plant on single chassis with two nos. rear axle & one no. swiveling front axle. The towing arrangement in the plant facilitates it to be towed by tractor or equivalent power. The plant comprises of adequate capacity gravel & sand hoppers with conveyors, Pan type mixer unit, electronic load cells, water tank, cement silo with screw conveyor, Rubber belt type discharge conveyor, PLC based control panel and three axles fitted with pneumatic rubber tyres. Salient Features:Fully automatic plant with mix material output capacity of 25 m3/hr.Easy mobility (Single Chassis); can be towed by tractor or similar power.Easy to erect since no foundation / civil work.Short cycle time and high uniform concrete quality.Two nos. twin hoppers i.e. total 4 nos. hoppers (2 x 2) for storage of gravels & sand.Each hopper storage capacity is 2.5 m3 ( Total storage capacity 10 m3 )Vibratory motor is fitted on one hopper meant for sand.Pan type Mixer unit of 0.75 m3 capacity fabricated from heavy duty steel is having 10 mm thick wear resistant replaceable liner plate.Spring loaded paddle mixer arms with replaceable blades.The mixing arms driven by Imported Planetary Gear Box coupled with 30 HP motor.The Pan Mixer is suspended on three nos. electronic load cells.Inbuilt water tank of 1000 ltrs. storage capacity with submersible pump.Inbuilt Additive tank with self priming pump.Cement Silo of 1.5 tons storage capacity with screw conveyor for transferring the cement to Pan Mixer unit.Rubber belt type discharge conveyor transfers the concrete mix output from Pan Mixer to transit mixer or concrete pump.PLC based control panel capable of storing 50 different recipes.Total connected Electric load 61.5 H.P. Stationary Concrete Batching Plant The plant comprises of adequate capacity gravel & sand hoppers, weighing conveyor suspended on electronic load cells, Pan type mixer unit, additive tank. cement silo with screw conveyor, Rubber belt type charging conveyor, PLC based control panel. Mobile concrete batching plant, model ne-30 output capacity 30 m3/hr. Model ne-30 is a fully automatic, compact mobile concrete batching plant with gravel & sand hoppers on single chassis with two nos. Wheel axles & separate frame for pan mixer. The towing arrangement in the plant facilitates it to be towed by tractor or equivalent power. The plant comprises of adequate capacity gravel & sand hoppers, weighing conveyor suspended on electronic load cells, pan type mixer unit, additive tank, cement silo with screw conveyor, rubber belt type charging conveyor, plc based control panel.